The miracle lead came exactly at the right time. 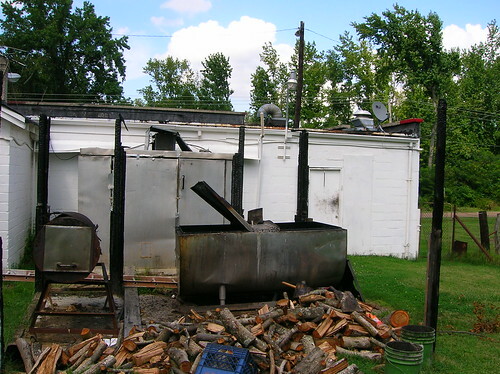 We received an email from John T. Edge claiming that a new intern at the Southern Foodways Alliance informed him about a BBQ man outside of Memphis that “ …cooks his butts using 90-100% field stump hickory. Yes, he chops his own wood chips!” Both Peter and I immediately looked at each other and were undoubtedly thinking the exact same thing; any man willing to use “field stump hickory” for BBQ is surely worth a Reconnaissance mission. When we walked in and saw only about four different items on the shelf, a fridge full of sodas, and a fairly sorry looking steam table, our expectations were dampened. It also didn’t help that we were the only customers within sight. We each ordered up a pork sandwich and then watched owner Morris Laddie carefully assemble them behind the counter. I feel a need to come clean and confess that I’ve always held it against any BBQ place (or region for that matter) that prides itself on a gloppy, ultra-sweet, tomato-based BBQ sauce. And Memphis and its environs are no exception. They also feel it is wholly appropriate to add sweet coleslaw to their pork sandwiches as well. Sweet plus sweet equals real sweet. What better way to mask an inferior pork? When I first laid eyes on Laddie’s pork, with its ultra-moist shreds and chunks of expertly smoked pig, I knew right away that this was something special. Even the issue of sauce/coleslaw became a moot point. Each successive bite of this sandwich seemed to elevate the greatness of the previous one. In fact, after savoring each bite of this sizable sandwich, I found it mandatory to order another just for good measure. What amazed me most about this sandwich, though, was that the obligatory sweet coleslaw and BBQ sauce never really stood a chance of messing things up when accompanying quality barbeque at this level. As Peter and I ate our sandwiches on the trunk of my Prius (like all good Prius owner’s do), locals slowly started to show up. Each would inevitably flash us a happy grin; the type one always seems to find at places that have the capability to put their loyal and gracious fans in (a sort of) culinary nirvana. Morris and his miracle pork, too, have their quiet believers. The only dark cloud to this tale, and it’s a big one (I mean the dark cloud part, not the tale), is the slow but steady encroachment of urban sprawl throughout this area (located about 25 miles east of Memphis). Mr. Laddie spoke with a reserved sadness as he conveyed to us how this area that he’s lived his whole life has slowly but steadily changed; that this type of change wouldn't include a rural BBQ operation such as his. God only knows how long he’ll stick around. When he does decide to call it quits, it’ll be another major blow to the ever-dwindling numbers of great BBQ establishments around the country. In my mind, there’s no better vacation than heading down to the land of Dixie in hot pursuit of great BBQ. It is a rare place indeed that will make the BBQ cloud’s part, the saucy siren’s sing, or even just make you smile for awhile. Morris’ grocery in Eads, Tennessee and his BBQ pork sandwich will blow your mind. 8:30 am and all I want is a bbq pork sandwich. That sandwich both looks and sounds delicious from your description. If someone on here were to plan a driving trip to Tennessee, would you have a "best of list" to share? That looks like a mighty good sandwich... but as a lifelong Memphian-by-proxy (nearly my entire family is from, and still resides there), I have to know--what other barbecue joint in Memphis' sandwich does this one most resemble? When I find myself in Memphis this December, I'm going to have to give Morris' sandwich a try. Naturally, I'm gonna swing up 385 to US-70/79 and follow it up with that old standby, fried chicken at the original Gus's in Mason. brandon_w wrote: If someone on here were to plan a driving trip to Tennessee, would you have a "best of list" to share? Here are a few Tennessee highlights—in addition to The Perfect Sandwich of Eads—from two trips and about two dozen generally excellent stops. More to come, one of these days. 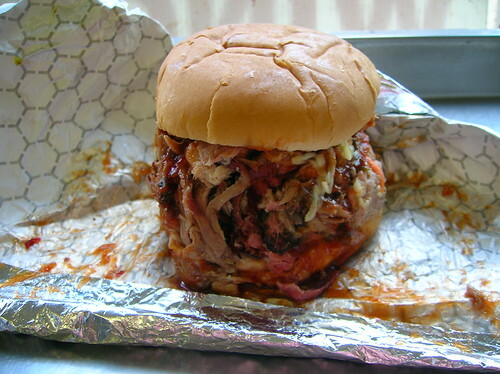 Evan B. Druce wrote: I have to know--what other barbecue joint in Memphis' sandwich does this one most resemble? In and around Memphis we tried barbecue sandwiches from The Bar-B-Que Shop, Neely's, Payne's, Leonard's, A&R, Top's and Woodstock. Morris' sandwich was in a different class than any of those. Details to follow, one of these days. Not to hijack another exceptional Pigmon backwoods discovery but I would point out that my Memphis trip incorporated many of Pigmon's recommendations as well (several of the ones Rene G mentions). So you can read more about several of them here. Well, Tennessee is 440 miles long from Memphis to Bristol. Any specific regions that you are planning to drive to? The suggestions provided by Rene G was our consensus list, as we discussed over lunch today. Hit any one of these gems, if not all, and you'll be a very happy camper. Evan B. Druce wrote: That looks like a mighty good sandwich... but as a lifelong Memphian-by-proxy (nearly my entire family is from, and still resides there), I have to know--what other barbecue joint in Memphis' sandwich does this one most resemble? In Memphis proper, none that I'm aware of. However, as Rene G noted above, the Woodstock Store & Deli in Millington, just north of the city does. An inferior effort compared to the Morris grocery but still a helluva sandwich. A massive one as well. Not yet. I guess I'm already thinking of next summer. Thank you for the info and pictures guys. PIGMON wrote: What amazed me most about this sandwich, though, was that the obligatory sweet coleslaw and BBQ sauce never really stood a chance of messing things up when accompanying quality barbeque at this level. I can't help but fantasize at what this sandwich might be without the sweet sauce'n'slaw. I'm also hoping to drive through the southern states again soon (this time northbound), and another puerco high on my list is at Archibald's in Northport, Alabama (have not seen any mention on this board). I did a semester's visiting prof gig at East TIN-ah-see State in Johnson City. Our go-to was Ridgewood BBQ in Bluff City. Even a dedicated KC bbq guy like me had to admit that that was good 'que. Thanks, Pigmon and Rene, for the tantalizing visuals. I can definitely see making this trip in the future. I'd just about kill for one of those sammiches right now! I read your wonderful responses regarding Morris Barbeque! It is the BEST in Memphis! I know it is the best in Memphis because I have tasted the scrumptous barbeque for a long time. Laddie is my dad and if the barbeque sucked to "high heaven", I would not be responding to this post! One forum member was wondering what the bbq taste like without the sauce. The bbq is AMAZING without the sauce! I remember relocating and tasting so bbq and it was horrible!! The bbq meat was "as dry as a powerhouse". I only finished the meal because my husband paid for with his hard earned money. I ONLY eat my Dad's bbq--plain and simple. The food is worth the drive-TRUST ME!!!! When I visit my Dad, I will be stopping by his place to grab a sandwich. The sandwich is massive and worth every cent! If you are ever in Memphis, visit my Dad's place! It is sad that major businesses are driving out Mom and Pop stores all over the country. My Dad has been a business owner for over thirty years and it saddens me that these`"money machines" can come into town and drive out businesses. My Dad is not only a wonderful business owner, he is also a wonderful person. He treats all people with respect and dignity and he appreciates your business. Stop by Morris Grocery and Deli the next time you visit Memphis! I had to drop in and thank PIGMON for his intrepid research. On our way from Memphis to Owensboro, we decided to pop into Morris Grocery, because of this thread. I'm not sure I can add anything to the OP that hasn't already been said, except for my full agreement. I, too, usually prefer the more dressed-down styles of barbecue sandwiches with maybe some finishing sauce and vinegar-based slaw. This sandwich eats like a smokey, porky version of a sloppy joe. I also don't like sweet barbecue sauces, but the one here is gently sweet without being cloying. I swear I tasted some fruity notes (apple?) Nor is it overly acidic or spicy. It's just a well rounded sauce that doesn't interfere with the pork. 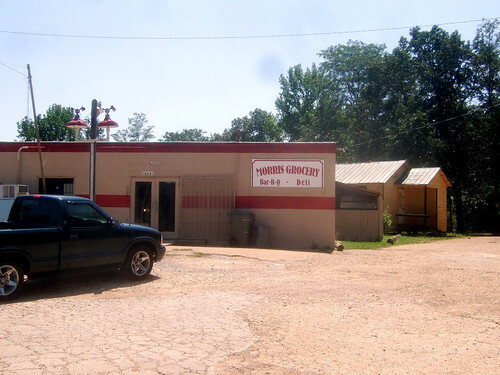 I just found this on google while looking for the Morris Grocery in Eads address! Nice find!! Yes Binko, I'm still dreaming of that sandwich, and you'd think I'd be tired of BBQ'ed pork after eating it for 3 days straight constantly. UniAddict wrote: you'd think I'd be tired of BBQ'ed pork after eating it for 3 days straight constantly. Why would ANY LTHer think that??!! That's what I would have thought, but when I woke up on Day 2, still feeling completely full, wondering how in the hell it was possible to stuff any more barbecue into my gut, I began to think there is such a thing as "too much pork." binko wrote: I began to think there is such a thing as "too much pork." Don't worry binko, your secret is safe with me! Binko wrote: That said, this sandwich was the highlight of the trip. It's good to hear you enjoyed Morris. Binko wrote: Inside the grocery store, we spotted a sign for Naked Lion sour mash beer near the cash register. I wonder if that's new at Morris. When we were there in August the best I could do was Miller (tasted just fine on a hot day). This is the first I heard of Naked Lion. So how was it? On our Memphis visit we were still going strong after barbecue sandwiches from Bar-B-Que Shop, Neely's, Payne's, Leonard's, A&R, Top's and Morris. But after all those, this monster from Woodstock had me thinking the same thing (as well as "too much Miller"). The sandwiches were so good that both Pigmon and I finished every scrap. Oh, they didn't sell it, and we couldn't find it at the one liquor store we had time to stop in. I didn't get the sense they actually carried it; they just had a metal sign for it near the cash register--I felt it was more for decoration than anything else. ...this sandwich was the highlight of the trip. So glad you saw the beauty of the Eads pork sandwich, Binko. As I said above, this sandwich has no rival anywhere as far as I know. Like so many other wood-burning establishments throughout the anals of BBQ history, The Woodstock Grocery's BBQ pit (out back) recently burned to the ground. I havent been to the store YET, but someone brought their Barbque to a work function and it was the best i have ever eaten. I have been trying to find out where they bought it and found out yesterday. I will be going to Morris's tomorrow. It was SOOOOOOOOOOOOOOOO GOOOOOOD!! If not, anyone want to chime in with a must-eat in Memphis proper? I was last there about 12-13 years ago and only ate at Rendezvous, Corky's, and Neely's. Road Trip to Memphis 2009 - BBQ, etc. There are few other worthy stops mentioned there, as well. Interstate gets lots of ink, but I wouldn't go back. I know it might not seem like much of a rec but the BBQ bologna sandwich is about the only bite in Memphis I ever give a second thought to there anymore (ok...Gus' every once in awhile). A perfectly grilled, perfectly toasted, perfectly proportioned effort. I love the sweetness of the slaw as a counterpoint to the saltiness of the bologna. In addition, The Bar-B-Que Shop has the best BBQ sauce by a country mile in Memphis. I have a feeling Morris Grocery only makes one batch of pork that's ready around lunchtime and sells out early. If you leave Chicago around 4 or 5am you might make it to Eads in time. Sounds well worth it to me. Seriously, if you're getting in at a reasonable hour you might call ahead and see if they'll set aside a sandwich or two for you. I have a feeling an old Morris sandwich will probably be better than most any other. 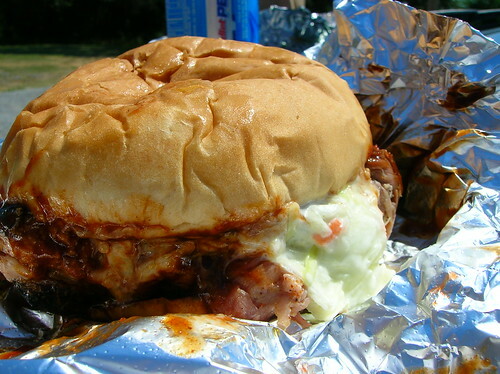 You've gotten some good suggestions but if it's a bbq pork sandwich you're after I'd consider Payne's (pictured above). There are two locations and a quick search suggests at least one is open to the early evening. Be sure to call. I didn't think the meat was nearly as good as at Morris but the sandwich as a whole was brilliant, an electric combination of smoky meat, sweet-hot slaw and spicy sauce. Be sure to get the hot sauce, not the regular. Woodstock Store in Millington (see above) is pretty darn good too but I'm not sure how late they serve. Going to Morris Grocery reminded me of going to DiFara Pizza in Midwood, Brooklyn. There are not a lot of solo proprietors. But Morris Laddie is one, and it is unlikely that Morris Grocery will be around in five years as the area is becoming suburbanized. I can't say that it is the single best BBQ I have ever eaten, but it was exceptionally good, particularly as Morris included a lot of crisp ends and I felt in the hands of a master as I watched him chop the pork for my sandwich. I particularly loved the smoky flavor of the pork. It was very powerful. Today so many of the Roadfood spots are only "good," but Morris Grocery is a culinary icon. Last edited by GAF on July 27th, 2011, 8:38 am, edited 1 time in total. 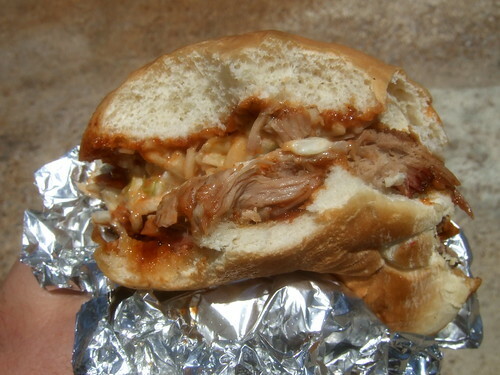 Last night I was reminiscing about this great pork sandwich, and I ended up on this website. As I read through the Facebook comments after the article, I noticed that the last one, posted yesterday, said that Mr. Morris was being laid to rest Sept 2, 2017. Several times in the past years I entertained the thought of taking a frivolous day trip down to Eads just for another bite of that pulled pork sandwich, and I'm a little sorry I never indulged that silly whim. But I'm glad I had one taste of that sandwich. To this day, it's my greatest barbecue memory and the best pulled pork sandwich I've ever eaten. RIP Mr. Morris.